Editor/Author Sibley, David R., Hanin, Israel and Kuhar, Michael, et.al. 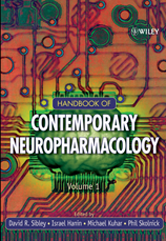 The Handbook of Contemporary Neuropharmacology is an invaluable resource for principal investigators and working scientists in academia, government and industry. Provides a readily accessible reference for students, professionals and libraries alike. Editors are recognized authorities in the neuropharmacology and science field. Comprehensive reference text for active junior and senior neurobiologists. Fills an important niche as a text between research publications and clinical applications.